Winter Performing Arts Session for Stage-Loving Kids! Do your children love to sing and dance in front of family and friends, and have dreams of being on stage? Let them join us for an exciting performing arts experience that will include training in voice and choreography, while helping to develop creativity, confidence, artistic poise, and personal presentation skills. The Artistic Directors of Boston's renown "Lucky Ten" Children's Vocal/Dance Ensemble are pleased to offer a one-week winter session for children and teens, ages 7-17. The session will culminate in a showcase performance for the entire family. Children will be taught by specialists in vocal arts, hip-hop, acting, and stage presence. We feel this blend of training will provide the most complete and positive experience for each child. Our students will learn how to put on a show together from the set and costume design to the whole production. 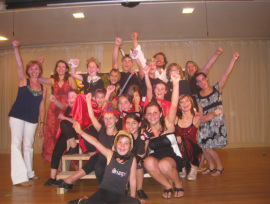 Experience being part of an ensemble… Make friends with other creative and artistic kids… Perform! For more information or to request registration materials, please call 617-462-9127 or 617-771-8881 or email luckyten@luckyten.org.